It's Time to Upgrade the "Kids" Table! and uncomfortable, but they can also be downright dangerous. certification, they're incredibly strong and can hold up to 300lbs. set a convenient fit for tight spaces, while its portability means you'll use it anytime, anywhere. an added bonus, the commercial vinyl upholstery is ultra-easy to clean. Why Choose Our Vinyl Table and Chair Set? Order Your Vinyl Table Set Now for Reliable Strength! Strength Meets Comfort: Thanks to 1.5in thick padding, our card table chairs have you sitting in the lap of luxury! Paired with triple cross-bracing and quad leg hinging, they can support up to 300lbs, offering you unparalleled durability and long-lasting comfort. Endless Versatility: Made with commercial vinyl and fabric upholstery, our card table set is easy to clean and resistant to stains! The tabletop measures 38x38" for an extra-large playing surface, while its 29.5" height makes it both wheelchair accessible and ADA compliant. Go-Anywhere Design: Perfect for dorms, apartments and anyplace space is limited, our fold away table and chairs occupy minimal room! And because they're so easy to move, you'll take them across the house or across town for use at church, the office and more. Trusted Durability: How can we offer strength and convenience in one? The secret is our powder coat frame! It makes our folding table and chair set resistant to scuffs and wear and safe for outdoor use. With 18-guage steel, it's high quality you can count on. Premium Customer Service: Why keep what you don't love? 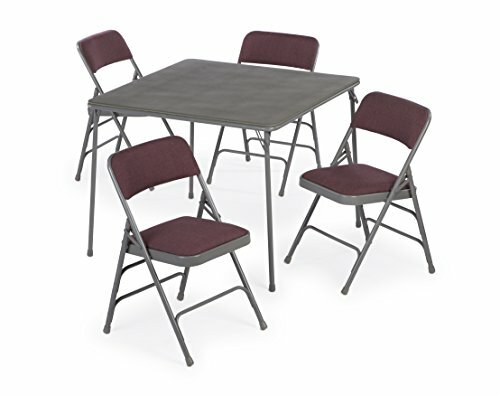 When you purchase our folding card table and chairs, you'll also receive our money back guarantee! If for any reason you're not completely satisfied, let us know and return the order for a full refund. If you have any questions about this product by Folding Chairs and Tables, contact us by completing and submitting the form below. If you are looking for a specif part number, please include it with your message.